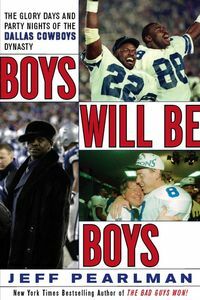 Editor's note: The following is an excerpt from Jeff Pearlman's new book "Boys Will Be Boys: The Glory Days and Party Nights of the Dallas Cowboys Dynasty," copyright 2008 by Jeff Pearlman. Reprinted with permission of HarperCollins. Purchase Jeff Pearlman's new book, "Boys Will Be Boys." He officially arrived on Sept. 28, 1995, a hobbled man with a healthy contract and the hope of a city resting upon his shoulders. Deion Sanders was not merely the football phenom who would save the Cowboys' porous pass defense (and, as he demanded, play a little receiver, too). No, he was the football phenom who would save the Cowboys. Need to shut down Jerry Rice one on one? Deion Sanders. Need a punt or kickoff returned for a touchdown? Deion Sanders. Need an offensive threat to draw attention from Michael Irvin? Deion Sanders. Though Sanders moved to Texas in late September, going so far as to purchase a $2.95 million home in the suburb of Plano, he came holding a black cane, his left ankle cocooned in a soft cast. In the month before his scheduled Oct. 29 debut against the Atlanta Falcons, Sanders planned on adjusting his family to a new location, rehabbing his injury and -- most important -- getting to know his teammates. Were there any apprehension from the newest superstar on that first day, it evaporated quickly. As Sanders entered the team's locker room, offensive lineman Nate Newton, the Cowboys' resident jokester, pressed PLAY on the CD player and blasted the volume. A catchy beat filled the air. Players started dancing. And pointing. And laughing. It was a rap tune. Not just any rap tune. Now playing: "Must be the Money"
So I called my momma and she said "Baby,"
Sanders could not stop chuckling. The Cowboy locker room felt like home. Seemed like Deion Sanders was always showboating, didn't it? "That was so funny," says Cory Fleming, the Cowboy wide receiver. "It was important Deion could laugh at himself, because Nate played that song every friggin' day for a month." Plastered throughout Sanders' new locker were 40 color Xerox copies of him interfering with Irvin in the '94 NFC Championship Game -- the play that, had a flag been thrown, could have changed the outcome. "In big red letters Mike wrote INTERFERENCE on each one," says Jim Schwantz, a linebacker. "Just hilarious." On one of his earlier days with the team, Sanders ran into Alundis Brice, who just so happened to wear uniform No. 21, Sanders' digits of choice, at a Dallas-based BMW dealer. The rookie defensive back had long wanted to own a BMW 325i, and he was here to make it a reality. "Brice, what are you doing?" asked Sanders. "I'm gonna buy this car tomorrow," he said. "But I first have to call my agent and set it up." "It's your first sports car?" asked Sanders. "Are you gonna pay cash for it?" Sanders asked. Sanders nodded and drove off. The next morning, Brice reported to Valley Ranch and was dismayed to spot his dream car -- a brand new metallic blue 325i with all the trimmings -- parked in the players' lot. "I can't believe this," he thought. "Somebody bought my car." When he approached his locker, Brice noticed the keys on his stool alongside a note from Sanders. It read: NOW GIVE ME MY DAMN JERSEY! "I wore numbers 22 and 38 in college (at the University of Mississippi), but they gave me 21 with the Cowboys," Brice says. "I had no emotional attachment to it. So when I read that note, I took my jersey down, hung it in his locker and got a new number. I'll never forget him doing that." With such acts of grace and kindness, it took Sanders little time to develop a following in the Cowboys clubhouse. Like any American office space, Dallas had its cliques, usually divided along lines of race and age. White veterans like Aikman, Daryl Johnston and Jay Novacek could be found in one pocket. The black defensive linemen, headed by Haley, were in another. Now, Sanders was fronting a new group -- the younger defensive players who envied both his game and his lifestyle. For all his Jim Thorpe-esque skills, Sanders was sleeping-dog lazy. In practices, he went all-out every third or fourth play and refused to wear shoulder pads because, he would say, "I'm not gonna tackle anyone anyway." In meeting rooms, he was known to doodle and doze off. Told early on that Cowboys who refused to participate in the team's weight training regimen would be fined, Sanders dramatically whipped out his checkbook and jotted down a five-digit figure. When Mike Woicik, the team's gruff strength and conditioning coach, complained about Sanders' indifference, Switzer sided with his new star. "We're talking about Deion Sanders here," Switzer told Woicik. "If he doesn't want to do something, he doesn't have to." Woicik was speechless. Credited by many players as a key to the back-to-back Super Bowls, Woicik was a no-nonsense taskmaster who demanded maximum effort. "For Mike, anything short of a funeral was an unacceptable excuse to miss a session," says Kevin Smith. "Mike had the personality of a lamp, but if you had to bench press he knew exactly how many you were supposed to do. When you came in and you didn't do it, he'd say, 'You were out f-----' around last night. You must've been drinking last night. You must have been drinking two nights ago.' He'd be pissed. He wouldn't speak to you for a week. If you tested on the bench and you didn't make it, he wouldn't say a word to you for a whole week until you came in and did it. That's how he was. Your goals were his goals." Who were the Dallas Cowboys becoming? "I still remember Deion's first team meeting," says Clayton Holmes, the veteran cornerback. "We were so fundamental about film. The way we studied it was critical. Well, Deion comes in, puts his feet up on a table and doesn't even watch." When Dave Campo, the Cowboys new defensive coordinator, asked the $35 million man to break down a play, Sanders let out a sly laugh. "Hey, Coach," he said, pointing toward the screen, "I got that dude right there. Wherever he goes I go. All that Cover Two stuff you're talking about -- y'all work that out." 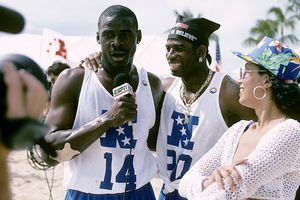 Deion Sanders and Michael Irvin -- quite a pair. Seeing that the Cowboys' defensive back meetings lasted significantly longer than they had in Atlanta or San Francisco, Sanders took a page out of the Barry Bonds Playbook by investing in a black leather executive's chair and rolling it into the conference room. As his peers sat in standard metal folding chairs, Sanders lounged in comfort. "Guys thought that was kind of funny," says Schwantz. "Maybe not right -- but funny." Although most veterans accepted Sanders' ego and indifference in exchange for the promise of otherworldly play, Aikman -- who had offered to defer part of his salary to help Dallas afford the defensive back -- was disgusted. It was bad enough Switzer approached discipline as if he were the proprietor of the Moonlite Bunny Ranch. Now here was "Neon Deion," teaching via example that image is everything and practice is overrated. From across the locker room, the quarterback would watch Sanders' postgame dressing ritual and cringe. As Jeff Rude of the Dallas Morning News described it: "Most people slip on a shirt when they get dressed. Deion puts on a jewelry store." Around his neck, Sanders placed two thick gold chains with dangling diamond-studded 21s. He wore a diamond-studded Rolex watch, two gold diamond bracelets and matching diamond horseshoe earrings. "There was a division between Deion and Troy that began to bubble over," says Kevin Smith. "We called it 'Double Doors' at Valley Ranch. Once we walked through those double doors it was football. We could laugh and joke, but it was all about football. To Aikman, that was sacred. "When Deion came in, something changed for the worse. Guys who should have been studying football on a Wednesday at 12 o'clock were focused on other things. Deion was such a freaky athlete that he could shake one leg and be ready to cover anyone. But the guys following his lead weren't nearly as talented. You know what they say about dogs that chase cars -- they don't live long." One of Sanders' most devoted disciples was Sherman Williams, the rookie running back with much talent but zero work ethic. "Deion had Sherman's ear 100 percent," says Kevin Smith. "He was a rookie who'd show up around 10 o'clock, 11 o'clock in the morning, smelling like weed and rolling with a posse. Guys like Sherman needed to be reminded of the importance of hard work. That did not come from Deion." "You led by example," adds Dale Hellestrae, the offensive lineman. "And his example wasn't very good." Sanders made his debut on Oct. 29, when the Cowboys thumped the Falcons, 2813, in Atlanta. The stars of the game were (ho-hum) Emmitt Smith (26 carries, 167 yards), Irvin (10 receptions, 135 yards) and Aikman (19 of 25, 198 yards, two touchdowns), yet the spotlight belonged to Prime Time. It was his moment in the sun. His day. In 44 defensive sets, Falcons quarterback Jeff George threw his way twice. The first time, receiver Bert Emanuel beat Sanders for an 11-yard gain. The second, Sanders batted down the ball. Though he talked as if he were the Muhammad Ali of the gridiron, Sanders' play in 1995 was merely OK. In nine games as a defensive back, Sanders intercepted two passes and contributed a paltry 22 tackles (that's a robust $318,182 per tackle). "Personally," says one Cowboy, "I thought Kevin Smith was a better player." Whereas the other primary cornerbacks -- Smith, Larry Brown and Clayton Holmes -- embraced contact, Sanders was a feather duster. When he tackled, it was with the gusto of a 90-year-old woman. "One time a running back ran a sweep toward him, and Deion dove half-hearted into the turf," says Case. "We're watching film the next day, razzing him pretty good. As serious as could be, he said, 'I saw that dude coming and I had to make a business decision.'" Jeff Pearlman is a former Sports Illustrated senior writer, and a regular contributor to Page 2. His previous book was "Love Me, Hate Me: Barry Bonds and the Making of an Antihero.". You can reach him at anngold22@gmail.com.